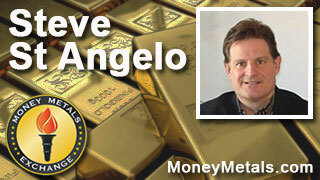 St. Angelo: "Something is going to break & people will get precious metal religion very quickly." Coming up, we’ll hear a fascinating interview with Steve St. Angelo of the SRSrocco Report. Steve gives us his insights on what we should all make of the market volatility that has developed so far in 2016 and how the stage is being set for what he calls a perfect storm for massive physical shortages and exploding prices in the gold and silver markets. You simply don’t want to miss my conversation with Steve St. Angelo coming up after this week’s market update. So is another financial crisis brewing? This week brought more signs that the economy and equity markets are teetering on the brink, with the Dow Jones Industrials gyrating wildly. At one point on Wednesday, the blue-chip stock index lost more than 500 points before paring some of those losses. Some fear that stocks could now be following the path of crude oil to much lower levels. Oil prices dipped as low as $28 per barrel this week. As energy producers struggle to cope with low oil prices, job losses and debt downgrades are mounting. And since we live in a world of government intervention, some are already calling for a bailout of the sector to protect banks and hedge funds from defaults on loans and bonds. So far this year, precious metals markets have shown resilience in the face of falling oil and stock prices. Gold shows a weekly gain of 1.0% to trade at $1,101 an ounce as of this Friday morning recording. Silver looks higher by 2.8% on the week thanks in large part to getting a nice bump this morning, with prices currently coming in at $14.33 an ounce. Palladium is trading up 2.4 % this week to $508 an ounce, while platinum is showing half the gain and is up by 1.2% and comes in at $841. When gold shows strength even as industrial commodities and equity markets tumble, that suggests gold is benefiting from the fear trade. But in order for a true bull market in precious metals to get underway, silver will have to start showing some leadership. And in order for that to happen, inflation expectations will probably have to start turning up. Right now, it appears as though the more immediate threat is a temporary bout of deflation. The latest Consumer Price Index report shows that CPI ran at a negative 0.1%.Even as medical and housing-related costs continue marching higher, falling food and energy prices turned the CPI slightly negative… but, of course, this government state is notorious for underreporting the extent of rising consumer prices. At some point, oil prices will bottom out and the deflation scare will end. But that doesn’t necessarily mean the economy will pick up. Falling oil prices are not just a result of the supply glut the financial media keeps talking about. Falling oil prices are also a symptom of weak demand. That’s being confirmed by retail giant Wal-Mart announcing plans to close more than 269 stores, most of them in the U.S. It’s being confirmed by decelerating corporate earnings across the board. Yes, something akin to an economic slowdown or worse may be a big theme of 2016. Some are predicting another financial crisis similar in magnitude to 2008. It may well be similar in magnitude, but it will be far different in terms of its consequences. In 2008, falling home prices led to a crisis in the mortgage market, which caused the economy to tank and stock market to crash, bringing down commodity prices in the process. This time around, the crash in commodities came first. Now the real economy is feeling the effects. And the Dow Jones is beginning to teeter over toward a bear market. Something seemed to break shortly after the Federal Reserve announced its rate hike in December. Whether the Fed’s fractional 25-basis point move triggered a change in the market’s psychology or whether the two events just happened to coincide is unknown. But now the Fed’s supposed plans to raise rates several more times in the months ahead are in doubt. The European Central Bank on Thursday signaled that it is leaning toward rolling out additional stimulus measures at its next meeting in March. The Europeans have joined the Chinese in devaluing their currencies against the dollar. Paradoxically, the global race to depreciate has added to deflationary pressures in the U.S. A stronger dollar has helped drive oil prices down, but it’s also working against U.S. multinational corporations that are trying to export to overseas markets. The pressures on the Fed to reverse course and pursue stimulus are mounting. In the meantime, the oil and precious metals markets will seek out an equilibrium price that enables supply to meet demand. The longer oil, gold, and silver prices stay below all-in production costs for many producers, the more supply will come offline. Supply destruction figures to be a major theme going forward in commodity markets. So even as the fundamentals for the economy and stock market appear to be deteriorating, the fundamentals for metals are improving. Well now, for more on how expanding imbalances between supply and demand will likely affect the precious metals markets going forward, let’s get right to this week’s exclusive interview. Who Cornered the Silver Market? Mike Gleason: It Is my privilege now to be joined by Steve St. Angelo of the SRSrocco Report. Steve is an independent researcher and investor who follows the precious metals and energy markets like few others, and has one of the very best content-based websites in our industry and it's great to have him back on. Steve, welcome back. It's good to talk to you again and Happy New Year to you. Steve St. Angelo: Yeah, Mike, the same. It's been an interesting year so there's plenty to talk about. Great to be here. Mike Gleason: Well Steve, we do have a lot to cover so I'll dive right in. And I want to start out by asking you about the divergence we're seeing between the global stock markets and the precious metals so far this year. Now, the metals haven't necessarily taken off, but they are up a little bit, which is a positive sign given the major sell-off that's unfolding in the equities market. So before we go any further, what do you make of the market action so far in the early part of 2016, specifically the way gold and silver have reacted to all the other market headwinds? Steve St. Angelo:Yeah, Mike. I think the last time we spoke I said, and this was I believe in the fall, August or so, if the markets were going to really crash during the end of 2015 I thought we would see a dislocation in the market, or we would see a bifurcated market. The metals would start taking off and heading north, and then the stock market would crash. Well we saw a little bit of that. It started to happen, and then of course I think the U.S. government and the Fed came in there and propped it up, because 95% to 98% of Americans are invested in that market, so it's in their benefit to keep that market propped up. Well we started to see that this year, and I think the reason why we haven't seen even higher prices for the metals, and if you looked yesterday (Wednesday, January 20th), the only thing that was really up, let's say besides Treasuries and a few stocks, gold and silver were up yesterday, where the Dow I think was off 550 points at one time. But the only 2 (things that were in the) green (were) metals. Cooper and zinc were down, but I think because the price of oil has been plummeting, it's kept gold and silver from going higher. But I think going forward, when we start to see more red in the broader markets, the Dow Jones, the S&P, I think we will start seeing higher prices in the metals and we're seeing that now. When the Dow goes down and the broader stock markets go down, the metals have been going up, not significantly, but they're not going down, and I think the reason for that is the deflation of the metals has already taken place. Silver, Mike, is down 71% from its high in May of 2011. The stock markets, even though everyone's worried, there's blood in the streets, they're only down like 10% or 11% from their highs. The metals have actually seen most, I think, of their down side, (although) I'm not saying they can't go lower. So I think going forward it will depend on what the Fed and central banks do, but once we start seeing more declines in the broader stock markets, I do think the metals will decouple and you'll see their prices move much higher. Mike Gleason: It certainly would be good news for metals investors, and if we do see this pattern continue, like you said, of metals going in the opposite direction of stocks you certainly would have to think that would be good for gold and silver, given the likelihood of a continued down draft in the equities exists. Now, you wrote a piece earlier this week highlighting the massive increase in physical silver investment demand. In that article on your SRSrocco Report site. You included some great charts that illustrated the point, one that shows how sales of Silver Eagles in the first 2 weeks of 2016 surpassed sales of Eagles for the entire year in 1996, just truly mind-boggling. Then last year the U.S. Mint sold I believe it was close to 15 times the amount of Silver Eagles than it did 20 years earlier in 1995, so investment demand for silver has been taking off here over the past few years and the last couple of decades now. Tell us more about that, what you're seeing there and what you make of all that. Steve St. Angelo: I think this is the issue that investors need to realize. It's not a matter of paper value. It's a matter of ounces. I believe David Smith spoke about this also in a previous interview with you. Investors really need to focus on that because the markets are broken, and I've listened to interviews, I spoke with some folks in the industry. Some of the top hedge fund guys, top fund managers are getting killed. If the smart guys are getting killed, well, it's must be the dumb money, and it's not the dumb money. Look what happened today, the ECB, (Mario) Draghi said that they're going to come back in the markets, and it boosted the European markets and now it's had its impact on the U.S. markets. It's all smoke and mirrors. We need to look at the long-term trend, and over the long-term trend we see, I think back in 1996, there was only 23 million ounces of silver bar and coin demand. Last year, 2015, I estimate it's going to be almost 240 million, ten times the amount. So even though the metals are not taking off, I think there's this innate wisdom by a certain percentage of people, and very few people, unfortunately, that they realize nothing has changed, and especially since 2008. And so, now that we're talking about that, I've got 2 charts that I want to talk about, and paper silver and paper gold I think are dying, and we're seeing it in the COMEX, but especially in the ETS. Before the prices of gold and silver peaked, there were only about 61 million ounces that went into gold ETFs from 2006 to 2010. Well, 142 million ounces went into actual gold bar and coin demand. Well after gold peak in 2011 we had a big change. Net investment or net flows into global gold ETFs actually fell 21 million ounces, and most of them, Mike, came out of the GLD. Well, we had almost a doubling of gold bar and coin demand. It was like 210 million ounces. We see right there that investors don't trust the paper metals, they trust the physical metals. It's even worse, it's a worse situation in the silver ETFs. They were about even before 2011, for the 5 years they were about even. After 2011 only 18 million ounces we saw a net build in silver global ETFs. However, nearly a billion ounces were invested in silver bar and coin. So it just goes to show you, investors are buying more physical silver and gold, and they're staying away from the paper ETFs. This is also, I think, why we're seeing a draw-down in the COMEX gold and silver inventories. So I think what's happening, people need to stop looking at the paper price because the markets are not real, and they should focus on how many ounces they have, because going forward we will see a revaluation in the metals, and at that point in time, and I think it will happen very quickly, it will be how many ounces you have, not what your paper investment is. Because it may not even be worth U.S. dollars at this point in time. That's how I look at the market and it's going to be interesting going forward. Mike Gleason: Yeah. We've talked about the divergence between markets here, and we could certainly see one between the physical metals market and the paper market, which is where the price is still set, but that may be changing at one point in the future here. You did say in the same piece, you pointed out how silver and jewelry demand has actually grown a little bit over that same 20-year period, so it's not like people are just switching their silver purchases from jewelry into coins and bars, that jewelry and silverware is still actually up slightly as well over that same 20-year period. I thought that that was important for you to note. Now obviously, supply destruction in all metals, precious metals, base metals, etc., is going to continue to be a big story as mining companies find it more and more difficult to extract those materials from the earth and turn a profit given the depressed prices in the futures market. So I want to ask you about how is this going to play out, because as we’ve just discussed we’ve seen a massive increase in investment demands, particularly for silver but also gold if you include all the central bank purchases, but we also have this dwindling production with the all in-cost of mining silver currently several dollars higher than the published market price for the white metal, and you've written that we may have already seen peak silver in America and about how countries like Mexico have seen production declines in recent years. How will the supply and demand imbalance play out? Steve St. Angelo: You see, that's a good question. I think supply and demand as the market has been pricing silver as a commodity will continue. That will change in the future and then it will be based more on its stored value, which is now competing against 100 trillion paper assets. So the problem is, U.S. silver production actually peaked 100 years ago, and not many readers understand that, investors understand that. It peaked in 1916, and that was about almost 79 million ounces, and what is also interesting, three of the top eight producing states in the US peaked before 1900, three more peaked before 1940. I think Idaho peaked in the 60s, and Nevada just peaked in 1997 in silver production, and that was due to its ramp-up of gold. There's a lot of byproduct silver from their gold production. So the U.S. has been played out. It was played out long ago. Now, what's interesting about Mexico, that is the number-1 producer, and I've been looking at some of the official data and it was incorrect, so I had some email exchanges with some of the official reporting sources. I said, "I think your data is incorrect." Sure enough, they hadn't looked at the Mexican Government INEGI website, which they had revised their figures. Actually, Mexico right now had peaked in production in 2013 at 187 million (ounces). In 2014 it fell to 185 and this year it looks like it's going to be 181. Now, I don't know if Mexico has peaked yet, but what's happened is, we've been bringing on more production on other primary miners, but others seem to be shutting down because of the price, and Mexico actually ramped up production significantly over the last five to seven years, but it seems to be stabilizing. Now, the worst thing going forward for the supply and demand situation will be the base metal mining industry, and as you know and a lot of your readers and listeners, most of the silver comes from copper, lead, zinc, and gold production. That's about 70%. And I think these copper mines, and the zinc and lead mines are going to start shutting down, and I think we will start to see production declines from the base metal mining industry, and that will impact production and supply. Now, I think the problem going forward is, the oil price is gutting everything. I think the oil price is the number-1 cause that is causing all this chaos in the system, because there's always debt. We have all this debt now in the system, and it's really not sustainable unless you have a growing energy supply, and when we had three or four years of $100-plus oil, we could keep all this debt in check, but it's becoming very difficult now, and deflation is a destroyer. It can destroy governments and organizations with high debt. So the production costs right now are falling, they're still falling a little bit for gold and silver producers. But even now, I've looked at some of my primary miners, very few are making money at this price, even with the lower oil price. So, Mike, going forward I think we're going to see a perfect storm, and it will arrive when institutions finally wake up, they don't have any silver investment. Hedge funds don't have enough silver investment, and this will happen at a time when the markets start crashing. More investors getting into gold and silver, especially silver, and then the supply will start to fall from the base metal mining industry and byproduct silver, and I think that will cause a perfect storm for the price of silver. I'm not saying this will happen this year, but the stress will increase as the years go on, and it could happen this year. Mike Gleason: Certainly the hot money, or the money from hedge funds and so forth have not been in the metals all that much to speak of over the last several years, and we do need some of that speculative money to get back into it in order to drive the prices up. So do you think that if we continue to see a down-draft in the stock market that some of those hedge fund managers, I know you've talked to some of these guys, they'll start to maybe increase their metals holdings for their clients and that will, in turn, drive the prices upward as we start to get more people into the market? Steve St. Angelo:Yes. You see, I'm not focusing on waking up the public. The public will, unfortunately, be the last folks to wake up. It only will take a percent or two of global buying of silver that will totally destroy the market. There just isn't enough silver out there, and so right now everyone is looking for yield, and what we're seeing now, that the energy companies especially are going to start to cut their dividend, because at this price, as well as other large Dow Jones companies have been borrowing money to pay dividends and buy shares. Well this is no longer an ongoing solution. They can't do this much longer. As a matter of fact, they're not doing it. We're going to see dividends cut not only in the energy industry but in other stocks, and so, I call it, "The death of the yield is coming." If you're not getting yield, then why would you stay in a stock price that is starting to fall, and if yield is falling, too? I think what's going to happen, and there's more to it that I want to get into in a minute here, but it's going to be protecting assets, no longer worrying about getting a yield. It's going to be, how do you protect what you have. Right now, even though we're seeing this one huge down-draft in the market, there's been some fear, I think it's more concern and worry. Fear hasn't come in yet. Fear will come in when we start when you start seeing another 2 or 3,000 points off the Dow. That's when fear will start coming in. When that happens, we will start seeing more investors coming into the metals. I do believe the debt issue is a huge problem, and that's the reason why we have zero interest rates or low interest rates, and that's something I'd like to talk to before we conclude this interview, because it's very important how the market goes forward. I believe, Mike, we will see 2016 could get very ugly, and I think investment demand for silver could pick up drastically. Going forward, I don't see a slow increase, I see a sky-rocketing price and sky-rocketing demand, and it will happen so quickly investors will not be able to protect themselves, and that's the irony of the whole market. Mike Gleason: Switching gears a little bit here, COMEX gold inventories have been falling in recent months, particularly in the registered category. Late last year these stockpiles, which are used to provide deliveries, dropped to record lows. Now it is a simple matter for holders to convert stocks from eligible to the registered categories, so it may be unwise to read too much into those numbers, but it is interesting to see the inventories and exchange warehouses at these lower levels. What is your take on all of this? Do you see much possibility the COMEX will run into delivery problems in the near future? Steve St. Angelo:This is the question that's been asked for years. I know Ted Butler talks about it, and I think now with the lower paper price of gold and silver a lot of precious metal investors are just frustrated, and I think in time it won't matter, Mike. I think there's going to be a dislocation. There's going to be bank closures, bank holidays, the market is going to shut down, and I think it will happen all at the same time. So it really won't matter, but I think looking at the COMEX and watching the gold registered inventories fall over the last five years, could we trust their figures? I don't know, but I think that is an indicator that shows you that the gold is leaving the exchange. Mike Gleason: At some point you have to think the West will run out of metal to say to the East, and when that happens you would think there would be some real fireworks. Wouldn't you say? Steve St. Angelo: Yeah. I think it's been an ongoing bleed, and I wrote an article. I don't have the exact date, but I think it was in October. The U.S. exported 19 metric tons of gold to Hong Kong. Our mine supply was 18.5 metric tons, so we exported for that month more gold to Hong Kong than our total domestic mine supply. So we still are running a small deficit when it comes to gold, and that can't continue. It keeps heading to the East, and at some point in time, and I think we're starting to see the markets are really going to turmoil. Currencies in different areas, I think it was the Russian currency was really falling today. You start seeing a lot of volatility in these markets and I think something is going to break, and when it breaks, I think, Mike, the markets are going to react in a way and people are going to get precious metal religion very quickly. Mike Gleason: You spoke about it a moment ago there. I certainly want to give you an opportunity to talk about what we're seeing with Fed policy, this potential debt bubble. What are you seeing in that realm, Steve? Steve St. Angelo: There's this one website, it's called, Our Finite World, and I've been looking at Gail Tverberg's work, and she runs that website, and I've been looking at her data, and she looks at energy, and GDP, and debt. I've been cherry-picking some information and charts and using them in my articles. However, I looked at it differently and I started reading some of her more present articles, and I'll tell you, a light bulb went off. It makes sense to me that what's happened, Mike. I thought the price of oil that we couldn't afford was, like $70, $80. Above that, the market started to get hurt unless we had a lot of debt being printed by the central banks. Below that the energy companies get hurt. According to her chart it's $20, so when the price of oil went over $20 in 2014 dollars, starting in the 1970s, the world started adding a lot of debt. So what we need to realize, and this is what I try to focus on, it's energy and the precious metal connection, the store of value connection, we added all this debt because the wage earner ... the wages didn't keep up, so we had to increase debt to keep them buying or to keep the system going. Now the world has so much debt, we can't have normal interest rates unless you're a banana republic, because you can't service a debt at a normal interest rate when there's $100 trillion in debt in the world or more. So interest rates had to fall. Falling interest rates allowed people to make lousy investments, especially in the shale energy industry. Now, here's the issue. Interest rates can't rise ever again, I don't think, so they have to actually go lower because there's too much debt, but the thing is, you can't increase the energy supply unless you add even more debt, so now we're at this conundrum where debt really can't increase because we can't afford to service the debt we already have. That's why interest rates are going negative. So I see what we're going to have is a disruption, a dislocation, and it will happen very quickly, and so this oil price falling now to $27, $28 (a barrel) is destroying that whole debt-based system. What happens is, all those assets, paper assets, paper debts, are based upon this growing energy supply, which we no longer can do. So even though the Fed raised interest rates by a quarter, if they're crazy enough to do that again, they will really destroy this market, so I believe they're going to go negative… they're going to go back down or negative, and we're going to see QE4. It's the only thing to keep this system going. Unfortunately, that's not a long-term solution. The long-term solution is, peak oil is here and I think we're going to see a collapse of production going forward, and that's going to impact, as I've said before in many in several of your interviews, that's going to impact the value of most paper assets. We're just getting a hint of the concern and worry of investors now. Wait till the thing really starts to implode. That's when we're going to see a lot more, especially the wealthy and institutions move into the precious metals. I'm not saying it's going to happen this month, but it's better to be in the metals now than wait or try to time this market, because it can change on a dime. So I wanted your readers and listeners to understand that this debt that we had allowed this expensive oil as well as expensive copper production to come on. The world can't afford this copper production, this copper price. They really can't, without all this debt, so when debt implodes, production of copper will implode, zinc, even the metals, the precious metals will fall off due to base metal mining. We will just see, I think, a cliff-like collapse of not only global production of oil and metals, even GDP, and you do not want to be in paper assets when that occurs, and this is not a 5, 10-year timeline. This will happen within the next several years. Mike Gleason: We see it much the same way. I think not only are we not likely to see an increase or a continued increase in interest rates. I think they'll probably reverse that and potentially even go negative. Certainly we've seen some trial balloons dropped there by some of the Fed governors. It's shaping up to be a very wild year in the global financial markets. We covered just some of that here. It feels like we're on the verge of something significant happening, so we'll have to wait and see, and of course we'd love to check back with you and catch up with you again as it all begins to unfold. And certainly before we let you go Steve, as we always do, tell our listeners a little bit more about the SRSrocco Report and what they'll find there if they visit your site. Steve St. Angelo: All right. I encourage anybody to come over. I put about two or three articles a week on the site. I focus on the precious metals, on mining supply and demand, energy, and I tie it all together. I'm working on a new silver market report that shows what's happened with the silver market since the 1960s and it's fascinating to realize how little silver there is. And before we go, I just want to add one more thing to this debt situation. Countries are dumping U.S. Treasuries, and what is amazing, Mike, why is the U.S. Treasury rate going down, if China, and Russia, and the world are actually dumping Treasuries? Somebody must be buying those Treasuries, and it seems to be right here in good ‘ole U S of A, and so how long can that go on? I wanted to let your readers understand the debt implosion is starting to happen. How it goes forward, if it increases. I think we're going to start seeing it increase. I wanted to end with that, because I do believe 2016 could be, it could be a barn-burner. Mike Gleason: I definitely appreciate it, and I do love the way you tie all that stuff together, the energy side connected with the precious metals, and then all of the debt markets and how they interrelate, and that's one thing that's so fascinating about your website and we certainly appreciate the service that you do there, and I definitely recommend people check that out. I certainly want to thank you again Steve, and all the best to you and your team there at the SRSroccoReport.com and we appreciate you joining us, and I hope you have a great weekend, and I look forward to catching up with you again soon. Steve St. Angelo: Thanks, Mike. You too. Mike Gleason: That will do it for this week. Thanks again to Steve St. Angelo of the SRSroccoReport.com, one of the best metals market-related sites in the entire industry. And be sure to check that out, and check back here next Friday for our next Weekly Market Wrap Podcast. Until then, this has been Mike Gleason with Money Metals Exchange. Thanks for listening, and have a great weekend everybody.